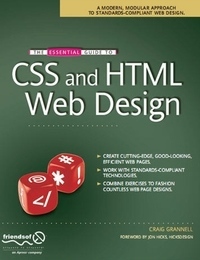 The Essential Guide to CSS and HTML Web Design is a special book—it will tell you all you need to know to design great web sites that are standards compliant, usable, and look great, but not overwhelm you with waffle, theory, and obscure details. It is designed to be invaluable to you, whatever stage you are at in your career, with a mixture of practical tutorials and reference material—beginners will quickly pick up the basics, while more experienced web designers and developers will keep returning to the book again and again to recap on techniques they maybe haven't used for a while, or look up properties, attributes and other details. It is destined to become a close friend, adopting a permanent place on your desk. It starts off by giving a brief introduction to the internet, and the broad area of web design, before diving straight in to HTML and CSS basics, reusing code, other best practices. It then focuses on all the most important areas of a successful web site—typography, images, navigation, tables, layouts, forms and feedback (including ready made PHP scripts for you to use,) and browser quirks, hacks and bugs. The book is completely up-to-date, covering support of the newest standards in all the latest browsers, including IE 7 and Firefox 2. The last chapter of the book provides several case studies for you to dissect and learn from, including all the most popular web site archetypes—a blog, a store front, a corporate home page, and an online gallery. Then the book is rounded off with several detailed reference appendices covering CSS, HTML, Color references, entities, and more, meaning that any details you need to look up are close at hand.